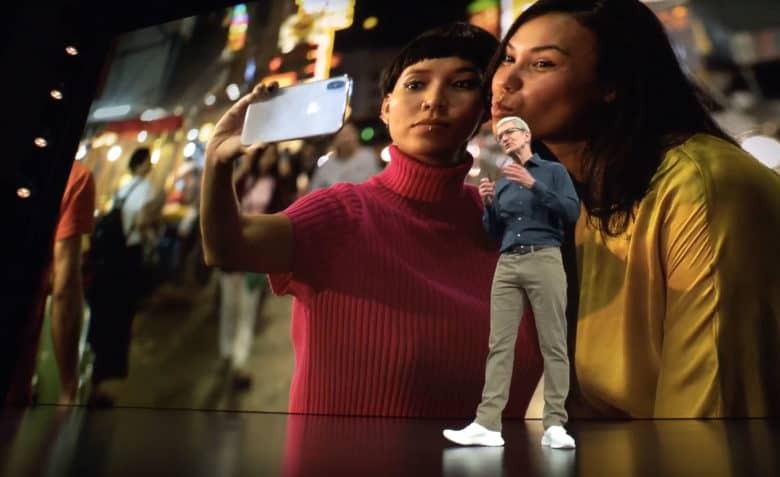 Tim Cook gets ready to unleash the iPhone XS during the Gather Round keynote in 2018. Apple’s iPhone XS Max has one of the best cameras in a smartphone – as long as you’re not pointing it at yourself. The flagship handset tied the Samsung Galaxy X9 Plus for fourth place in a new set of test protocols from DxOMark Labs, which has tested and ranked digital cameras for 10 years. The Google Pixel 3 and Samsung Galaxy Note 9 tied for best front-facing camera in a field of 12 smartphones. The Xiaomi Mi MIX 3 scored two points higher than the iPhone XS Max. The iPhone XR was not among those tested, though DxOMark plans to test more front-facing cameras. The iPhone X was the only other iPhone in the test, but its score was only two from the bottom. These are 12 smartphones tested for selfie-cam quality and the scores. The importance of the scores depends on how much you like your own face. The iPhone XS Max rear-facing camera system has one of the best DxOMark scores with a 105, which is four points behind two Huawei handsets that have three rear-facing cameras. The XS line has two. The score may also offer insight into which side of the smartphone is most important to the various camera teams at the companies producing smartphones. DXO Mark puts the selfie camera through the same rigorous studio and field tests with more than 1,500 images plus several hours of video. The top-ranked Huawei Mate 20 Pro was in the middle of the pack for front-facing cameras. You can learn more about the DxOMark Lab selfie camera test guidelines here. The challenge with front-facing cameras is the relatively short distance – often arm’s length – from sensor to subject. DxOMark tested each handset from three distances – 30 cm, which should fill the frame, 55 cm, and 120 cm, an average distance when a photo is captured with a selfie stick. DxOMark also examined Bokeh, High Dynamic Range and did close-up pictures of dead leaves, which provides a good gauge for noise. “The Google Pixel 3 has the edge in terms of focus system, but the Note 9 achieves better results for exposure and color,” the DxOMark Lab report said. “Images captured with the Google device show slightly stronger contrast and a cooler white balance. The Samsung (Note 9) is a little better at exposing for faces and applies a little less contrast to faces, making for a slightly more natural look. DxOMark makes no mention of the so-called “Beautygate” controversy revolving around the iPhone XS front-facing camera. Shortly after its release last fall, users took to Twitter, YouTube and chatrooms to complain about how the XS selfie-cam seemed to change skin color and texture. Apple denied adding a beauty filter and experts noted the effect was because of aggressive efforts to reduce noise. This was fixed in an iOS update.